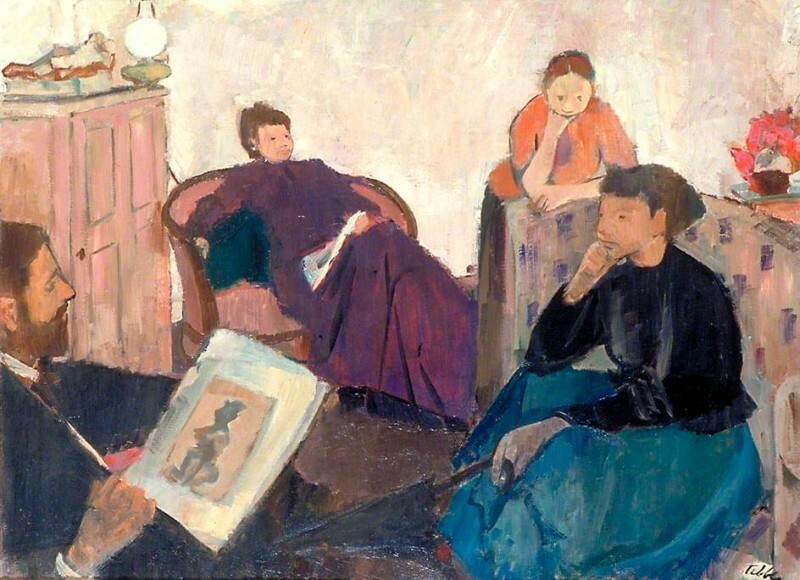 A painting-within-a-painting first captured Tom Sutcliffe, Arts Broadcaster at Radio 4, who explained his fascination with 'The Discussion' by Geoffrey Arthur Tibble in an ‘artwork in focus’ story for Art UK. The painting, held in Government Art Collection, shows three women in long skirts sitting in a room with a bearded gentleman. The male figure is holding a picture within the picture, of... what? A book? A magazine? Could we ever know truly what was going on in that room in 1948 – the subjects would have long moved on, and may not even remember it themselves. 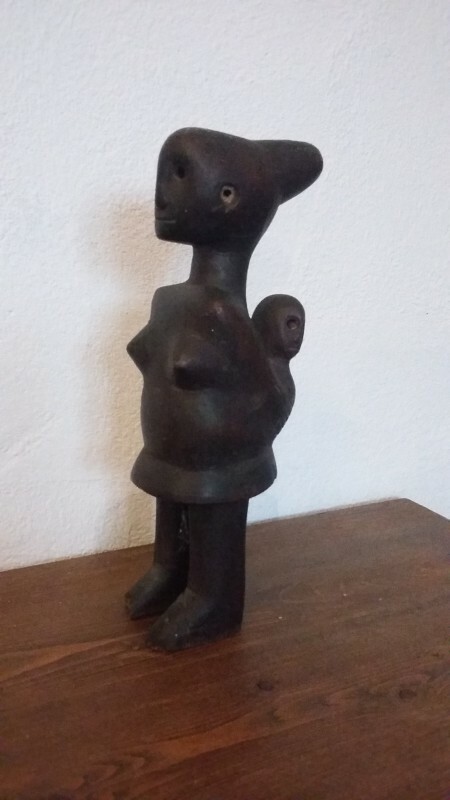 Tom assumed the picture-within-the-picture was the subject of the discussion taking place within The Discussion, and the people at the gathering were Bloomsbury types, discussing an exhibition, the picture a catalogue of what appeared to be a West African sculpture. Yet why were the figures dressed in Edwardian garb, lit by an oil lamp, in the 1940s? Art Detectives agreed: it was puzzling the sitters looked very nineteenth century. Was it knowingly a history piece, or was it a painting from life of a group of art enthusiasts or a seminar? Was the bearded man a connoisseur? Dress historian Lou Taylor confirmed the women seem to be a 'conjuring' up of the c.1900 period – with full-length wide skirts, high-necked bodices and c.1900 hairstyles – as did the male figure. Tibble did paint historical subjects, and connoisseurship was a subject in a number of his early post-war paintings. Martin Hopkinson explained there to be ‘quite a group of Nabis-influenced interiors in British public collections’. It was confirmed: Martin Gayford's Telegraph review of the 2002 retrospective described his work as ‘dingy but packed with period atmosphere’. Considering current fashion’s recycling of decades it is perhaps not so surprising an artistic group of young people would experiment with nostalgic dress, fifty years out of date. But would we ever know? Surprisingly, Art Detectives were pleased to see a post appear from the daughter of the artist. 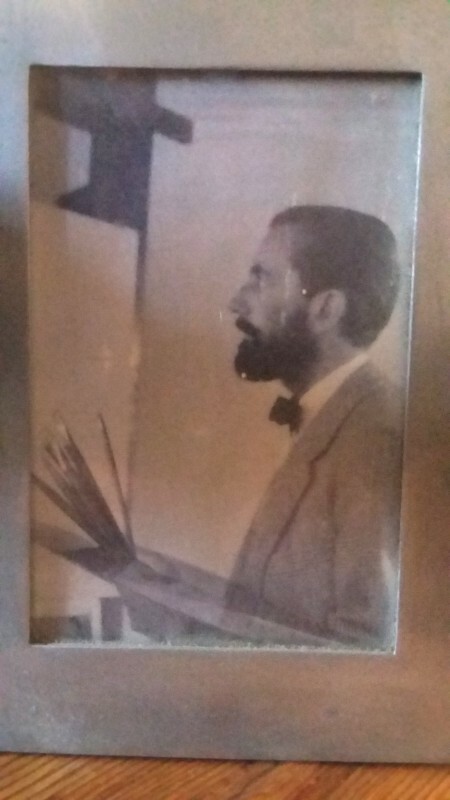 Georgina Hamilton-Eddy explained the bearded man was actually the artist himself, and a rare self portrait at that. Their mother was his usual model, and her father often inserted objects from their home into his work, such as the odd umbrella, teapot or telephone. Not forgetting the figure depicted in the mini-picture being held by the artist: an ebony African sculpture pictured in the ‘catalogue'. Georgina explained several years after this work was painted the family moved back to Beaconsfield, where Geoffrey Arthur Tibble sadly passed away. Another daughter of the artist also posted a comment. Much to the delight of Art Detectives, Paula Barnett attached a photo of an African wooden carving highly likely to be that which is the subject of the catalogue or magazine in the foreground. Paula also recognised the curved settee, and attached a dashing picture of her father with paintbrushes and the distinctive beard of the gentleman in the painting. As the Government Art Collection put it, what ‘what a mine of rich detail’, thanks to Georgina and Paula. GAC intend to flesh out the painting record with the help of the artist’s family. It strikes me that these connections may not have happened, and The Discussion to remain a mysterious unknown moment frozen in oils, without the internet: if only we could go back to 1948 and explain how the story has come full circle. It would really give the group something to discuss. Can more be found about Geoffrey Arthur Tibble's 'The Discussion'?